PHOENIX – Medical education at the University of Arizona College of Medicine – Phoenix has received a big boost with the latest in simulation technology from SynDaver™ Labs – and the city will get an economic boost as well. 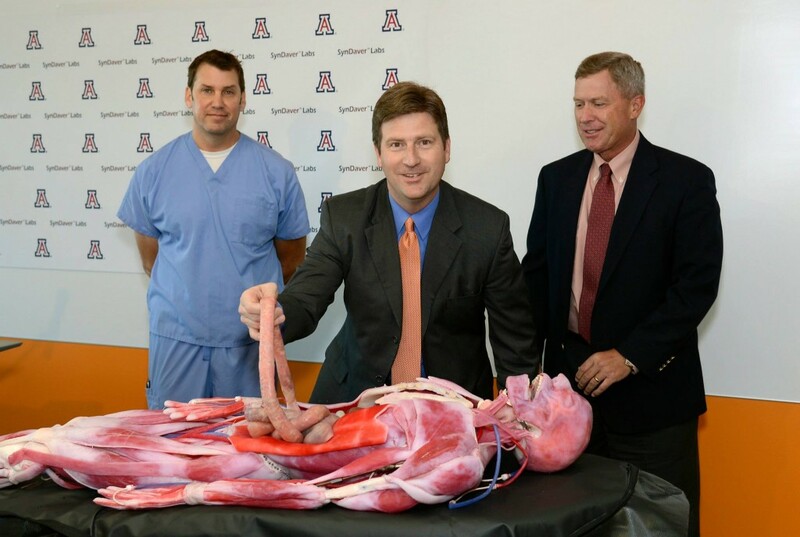 Phoenix Mayor Greg Stanton (center), UA College of Medicine – Phoenix Dean Stuart D. Flynn, MD (right) , and SynDaver™ Labs’ President Christopher Sakezles, PhD (left), on Wednesday, announced an exclusive collaboration between the medical school and Tampa, Fla.,-based SynDaver™ Labs. Sakezles said it could create up to 1,000 jobs over the next several years. Developed by SynDaver Labs, the teaching tools helps in anatomy and physiology instruction for medical and other health-related education. The company manufactures the world’s most sophisticated synthetic human tissues and body parts. The technology is used to replace live animals, cadavers, and human patients in clinical training and surgical simulation. The simulation center is a new, state-of-the-art endeavor that combines technology with healthcare-focused education. Students get to learn the difficulties faced every day in the medical world, no matter how much experience they have. The simulation lab can be set up to encompass a wide variety of situations, training the students for the world they will soon enter in real patient care. The University of Arizona College of Medicine – Phoenix admitted its inaugural class of first-year medical students in August 2007. The College of Medicine – Phoenix currently has 282 students training to be physicians. The University of Arizona College of Medicine – Phoenix inspires and trains individuals to become exemplary physicians, scientists and leaders who are life-long learners and inquisitive scholars and who will embrace professionalism, innovation and collaboration to optimize health and healthcare for all. 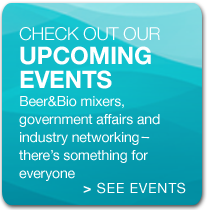 SynDaver™ Labs is a rapidly growing company located in Tampa, Fla. that manufactures the world’s most sophisticated synthetic human tissues and body parts that mimic the properties of live tissue. Our SynDaver™ Synthetic Human is the most sophisticated surgical simulator ever devised. Our impressive product line, extensive patent portfolio, and unrivalled experience in this area make us the undisputed world leader in live tissue replacement technology. Our products are used in a variety situations ranging from surgical simulation to trauma research for the military. We have even been featured on MythBusters and Grey’s Anatomy. 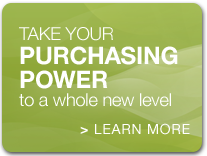 Our list of partners include every branch of the U.S. Military, the Consumer Product Safety Commission, Underwriters Laboratories, and the Food and Drug Administration. All of our products are made in the United States. 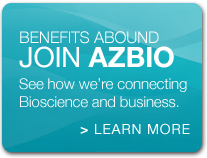 Posted in AZBio News, BioScience, Health, Members and tagged Christopher Sakezles, City of Phoenix, Dean Stuart Flynn, Mayor Greg Stanton, Medical Education, SynDaver, UA College of Medicine Phoenix.